The MNWB is extremely pleased to announce that volunteer Alexe Finlay, who has given outstanding support to seafarers’ welfare on the Tees for nearly 30 years, has been unanimously selected as the winner of this year’s Annual Awards for Services to Seafarers' Welfare 2017. The award will be presented to Alexe at the MNWB PWC Conference on 29 November 2017. The Board would like to take this opportunity to thank its constituent members for nominating such a worthy group of candidates. A new fund has been launched to help ships’ crew members who may need welfare support while visiting the Port of Tyne. Over 100,000 seafarers arrive at the Port of Tyne each year. The welfare, conditions and pay of seafarers varies greatly around the world. Some merchant ships can be at sea for nine months or more at any one time, meaning the crew are away from their families for long periods. 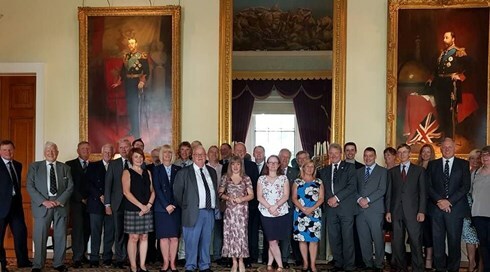 The International Seafarers Welfare Assistance Network (ISWAN) will officially launch its highly acclaimed International Port Welfare Partnership (IPWP) programme during London’s International Shipping Week at a formal Business Breakfast in the historic setting of Trinity House from 08:00 to 10:00 on Wednesday 13 September 2017. The IPWP programme is based on a small but highly impressive pilot project that ended in May 2016, having successfully established seafarers’ ‘welfare boards’ in Europe, Africa, Australia and America. Designed to bring together maritime leaders, the Business Breakfast will show how the IPWP programme, a joint initiative managed by the Merchant Navy Welfare Board (MNWB) on behalf of ISWAN, is driven by the Maritime Labour Convention, 2006 (MLC 2006, Regulation 4.4). The MLC 2006 advocates the establishment of seafarers’ welfare boards to co-ordinate and improve “access to shore-based welfare services”, for the benefit of the seafarers’ workforce, worldwide. The MNWB has successfully operated welfare boards, also known as Port Welfare Committees (PWCs), for nearly 70 years and is keen to partner ISWAN to share best practice with the rest of the maritime sector. PLEASE NOTE THE LAUNCH IS BY INVITATION ONLY. Our Port Horizon project has discovered that the ancestors of Southampton’s Black & Minority Communities in Southampton who were Merchant Navy seaman sacrificed a great deal during World War One & World War Two. Among their contributions, they ensured vital wartime supplies and support from friendly nations reached Britain. These are the legacies of port cities like Southampton – but those stories are not often heard or shared. Unity 101 Community Radio and the Port Horizon project have arranged a gathering to acknowledge the contributions of our forefathers in the British Merchant Navy and all the people from the Police, Fire and Ambulance The event is not a celebration of war, neither a replacement for Merchant Navy Day. It will be Southampton’s first BME, multi-faith, “thank you”. On 17th September 2016, after a total of 56 days at sea, large Push Tug ‘Dios’ & Barge ‘Diosa’ arrived in Gibraltar for provisions. The Panamanian flagged vessel with a Syrian, Egyptian and Somali crew had sailed from Gabon, West Africa. On arrival, Port State control identified a significant number of deficiencies making the vessel unseaworthy. Furthermore, one member of the crew was sick and had not been able to see a doctor. As a result, Gibraltar Maritime Administration (GMA) detained the vessel and on further investigation identified the fact that the crew had not been paid for months. The GMA immediately informed Gibraltar Seafarers’ Welfare Board (GSWB) members and trained ship welfare visitors attended the vessel to provide welfare support to the individual seafarers. The sensitive political situation surrounding nationalities coupled with the war in Syria compounded crew issues, however, ITF worked hard to recover unpaid wages and helped repatriate the majority of the crew. Only a skeleton crew of Syrian seafarers now remain on board and they receive regular visits from GSWB member organisations, in particular Apostleship of the Sea and Mission to Seafarers volunteers. They are provided with free phone cards to contact their families, shopping essentials and allowed access to the ‘drop in’ seafarers centre in Gibdock, which has a free Wi-Fi service, pool table, telephone, small library and a TV. ‘With many family members living in war torn Syria, this continues to be an extremely stressful time for the crew’ stated Capt. James Ferro MBE, GSWB Chairman and volunteer ship welfare visitor. With the support of the Gibraltar Port Authority, the welfare board has provided a forum to encourage and promote interagency collaboration and ensured that these unfortunate crewmembers receive the support they need.